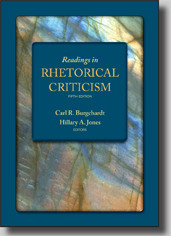 Burgchardt and Jones, Readings on Rhetorical Criticism, 5 ed. This highly acclaimed book surveys major approaches to rhetorical criticism through significant essays that explain and illustrate them. From H. A. Wichelns’s groundbreaking “The Literary Criticism of Oratory” to very recent essays on visual argument, film studies, gender and race issues, and public memory, the essays in this volume reflect the historical development, diversity, and current practice of rhetorical criticism. In this edition, important new selections from the literature and an updated organization reflect current issues, scholarship, critical perspectives, and classroom needs. Collectively, the classic and contemporary essays in this book are among the most important and widely cited in the literature. For a detailed table of contents, please click on this line. “It is the best and most complete collection. Excellent selection of studied essays and newer material." “I adopted RRC for its comprehensive and even-handed treatment of the rich tradition of scholarship in Speech Communication on the theory and practice of rhetorical criticism. I'm satisfied!" Carl R. Burgchardt teaches rhetorical criticism, United States public address, and media studies, with a special emphasis on film, at the Colorado State University. He received his B.A. from the Pennsylvania State University, and his M.A. and Ph.D. from the University of Wisconsin–Madison. He has published essays and book reviews in the Quarterly Journal of Speech, the Western Journal of Communication, Argumentation & Advocacy, Adaptation, and the Historical Journal of Film, Radio and Television. His book Robert M. La Follette, Sr.: The Voice of Conscience won the Outstanding Scholarship Award from the Colorado Speech Communication Association. Hillary A. Jones teaches courses in rhetorical criticism, rhetorical theory, critical/cultural theory, visual culture, and new and digital media at California State University, Fresno. She received her B.A. and M.A. degrees from Colorado State University and her Ph.D. from the Pennsylvania State University. Her work has been published in Critical Studies in Media Communication, the Southern Journal of Communication, the Journal of Communication and Religion, Rhetoric Society Quarterly, and Communication, Culture, and Critique.